There are now just 3 days to go until the Furever Home Friends books are available for sale! To celebrate, we're continuing with our one-week Dog of the Day countdown! Today's Dog of the Day is Chance the Pupper! How cute is that name?! Chance is a beagle mix, and he's about four years old. 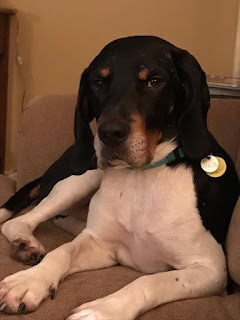 Like Buster and Pepper, Chance has found his forever home, and represents another success story about adoption. Chance's owner, Margaux Jacobs, is a recent college graduate and a huge supporter of the #AdoptDontShop movement! Here is what she had to say about Chance's story! "Meet Chance the Pupper! Chance is a ~4 year old Beagle mix who came to us from Homeward Trails Rescue in Fairfax, VA. Homeward Trails was having a 'home for the pawlidays' event in November so doggies could have a home for the winter holidays, and Chance was thrilled to be out of the shelter. "When he first came home he went straight for his spot on the couch and slept a lot, but now he has lots of energy and loves going for walks and refereeing the other dogs at the dog park. Chance loooooves belly rubs more than anything and never wants them to end. He is very vocal and talks to you all day and as soon as the alarm clock goes off he's ready to start the day (preferably with lots of kibbles). "Chance is a really good boy and is so appreciative of a nice home with a warm couch, and we couldn't imagine life without him." Thank you to Chance the Pupper for helping me count down to the Furever Home Friends book release on August 11!